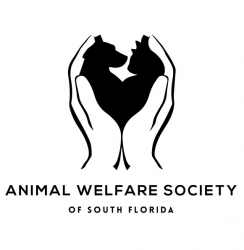 Animal Welfare Society of South Florida is a not-for-profit 501-C-3 full service, low-cost animal hospital that provides quality conventional veterinary care for pets. For over 43 years we have helped those who cannot speak for themselves. Dr. Martin helping one of clients with his dog "Negra." Mr. Rodriguez had fallen upon some hard times and was living on the street when his beloved dog became ill. We were happy to help her with free care and assisted in their placement at the Camillus House.